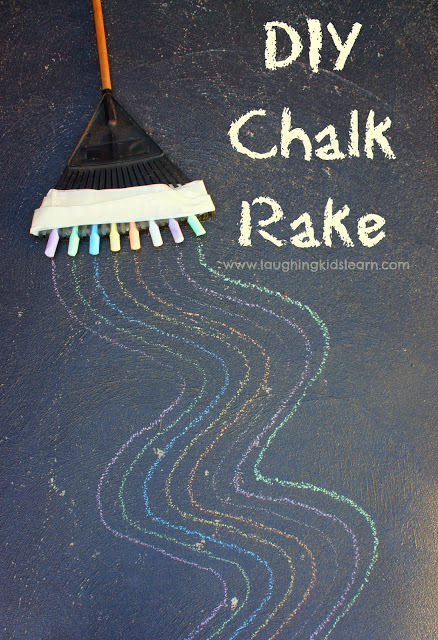 This time of year we love doing all sorts of things with chalk, but I never thought to make a sidewalk chalk rake before. It’s a fun little engineering project for kids that comes together quickly and gives you the fun of drawing a whole rainbow (or just a lot of lines) at once. The full details are at Laughing Kids Learn. I’m definitely adding it to my summer fun list! Want more learning fun with chalk? Check out these reading and math activities done with chalk from Mom It Forward, this awesome roundup of learning and play activities from Pleasantest Thing and seven fun games to play with chalk from NutureStore. How do you like to play and learn with sidewalk chalk? I’d love to hear your ideas.